Corporations and their representatives in Congress and the administration are pushing hard for “corporate tax reform.” What this really means is even more tax cuts for the rich. As a vote approaches there will be a well-funded disinformation campaign to push these cuts. Watch out for this. What the country really needs is a return to the 50 percent corporate tax rate. Corporations and their representatives (also known as “members of Congress”) are pushing for “corporate tax reform” – which is another way of saying “another cut in corporate tax rates.” Many news outlets are suggesting that the new Republican-led Congress will be able to find “common ground” with President Obama in this effort. The main argument for another cut in corporate tax rates is that “The U.S. has the highest corporate tax rate.” A Google search for that phrase yields thousands of results, beginning with corporate-funded conservative outlets like the Heritage Foundation, the American Enterprise Institute (AEI), the Cato Institute (formerly named the Koch Foundation), the Heartland Institute… Here’s a good one for the old-timers: “The Laffer Center” at the Pacific Research Institute. Unfortunately, you also see this corporate-conservative propaganda line coming out of the Obama administration. The top corporate tax rate used to be 52.8 percent of profits after costs, salaries, expenses and various tax breaks are deducted. Then it was lowered to 48 percent. Then 46 percent. Now it is only 35 percent. This is a decrease of more than 30 percent in rates. How did corporate tax rates get lowered from over 50 percent down to 35 percent? Corporations argued that these rates were “not competitive” and corporations and investment would move from the U.S. if they were not lowered. So we lowered the rates. Does that sound familiar? Then the corporations went from country to country, using the same argument and making the same threats. Country after country lowered their rates to remain “competitive.” And now, after a round of this, the giant corporations are back, making the same threats. If we lower rates they will go from country to country again, making the same threats, until there are no corporate taxes. Because of these cuts the share of federal revenue (the “tax burden”) that comes from corporate taxes has fallen from around 32 percent in 1952 to around 8.9 percent now. As a share of gross domestic product (GDP) it has fallen from about 6 percent of GDP then to less than 2 percent now. When corporate taxes are cut the rest of us have to make up the difference – usually through cuts in the things government does to make our lives better like maintaining our infrastructure, funding education, funding basic scientific research, etc. This includes smaller domestic companies that don’t have armies of tax consultants. Cutting taxes on the corporate giants hurts our country’s smaller “main street” businesses and places them at an ongoing competitive disadvantage. So What If Rates Are Higher? Even if corporate tax rates are higher here than in other countries, so what? Corporations here get a lot from us and should contribute a fair share of the return on out investment in their prosperity. Corporations are simply legal structures – creations of our government, We the People. We created them to serve us, not to serve a few already-wealthy people at our expense. Hungerford includes a chart showing that U.S. GDP growth actually decreases as corporate tax rates decrease. He does not assert a causation, but the country has been forced to reduce spending on infrastructure, education, research, and other things that improve long-term economic growth because of cuts in taxes on the wealthy and corporations. 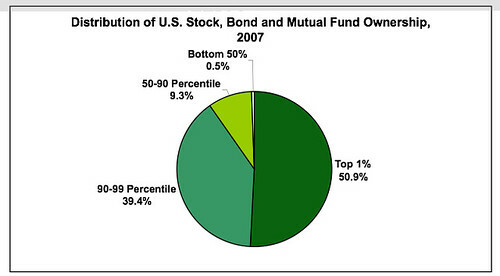 In 2007 the “bottom” 90 percent of us owned 9.35 percent of all corporate stock. The top 10 percent owned the rest. Income and wealth have concentrated upward since then, with all economic gains from the recovery going to the top few — so it’s worse now. According to the Federal Reserve, the wealthiest one percent of Americans own 52 percent of all directly owned, publicly traded stocks in the United States. The top 5 percent own 82 percent of directly held stocks. … And roughly half of Americans own some stocks through mutual funds and pension funds. … But only about a third of all Americans hold more than $10,000 in stock, according to a report from the Economic Policy Institute. So while more Americans hold stock, they don’t hold much. Corporations “strip income” by having a non-U.S. affiliate “loan” money to a U.S.-based affiliate. The interest is deductible from U.S. income so taxes are lower. In fact the country really does need to reform the corporate tax structure! We need to eliminate the loopholes that let the giant multinational corporations hide profits outside of the country. We need to collect the up-to-$700 billion of taxes already owed us on already-booked profits held outside the country. We need to eliminate loopholes that encourage companies to move jobs, factories, call centers, research facilities and key resources out of the country. And mostly we need to return the top corporate tax rate to 50 percent. Corporations are entirely creations of law and government. We should not let a few already-wealthy people reap the entire return from We the People’s mutual investment in education, infrastructure, research and other things that We the People provide to enable these companies to prosper. Increasing the corporate tax rate will help restore the funding to these, to prepare our country to compete in the 21st century economy. Increasing corporate tax rates will also help reduce inequality, because the top few are the primary beneficiaries of corporate tax cuts. It will help fund our government in its effort to do things that improve the lives of We the People and not just the already-wealthy.